The Just For You individually wrapped hotel soap is a round soap bar like most other hotel guest sized soap. The hotel soap is Individually wrapped in a smart and crisp white paper with simply "Just for You" printed on a green label accross the front. This also sets it apart from the usual range of hotel guest soaps. 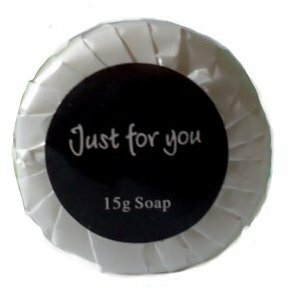 The Just For You minature hotel soap has a pleasant and not overpowering fragrance which will leave the guest clean and fresh smelling. The wrapped15g hotel soap is the perfect sized for a hotel complimentary product.